There are many mansions in New York city, but there is only one castle- Belvedere castle - a gothic structure in the middle of Central Park with a stone facade and turrets that’s meant to invoke the idea of a romantic Medieval villa. 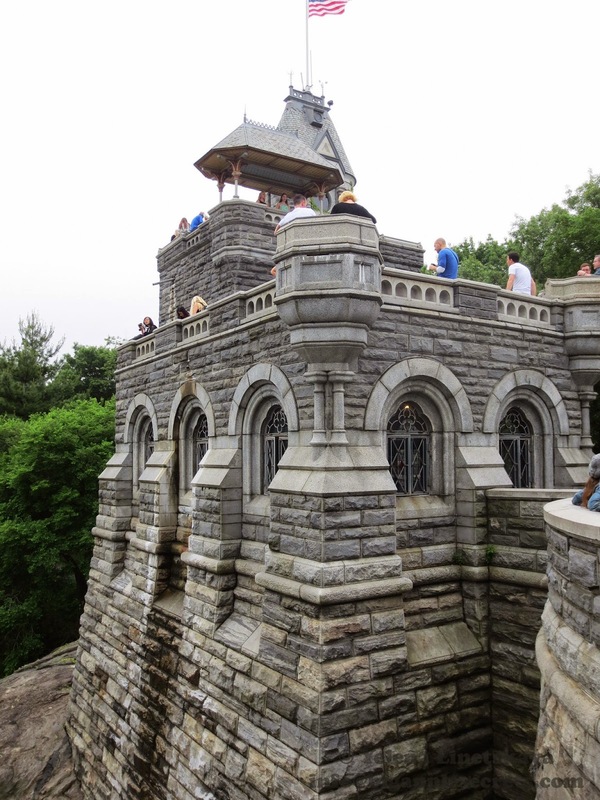 Boasting one of the highest and most spectacular views in the park, Belvedere Castle sits atop Vista Rock. 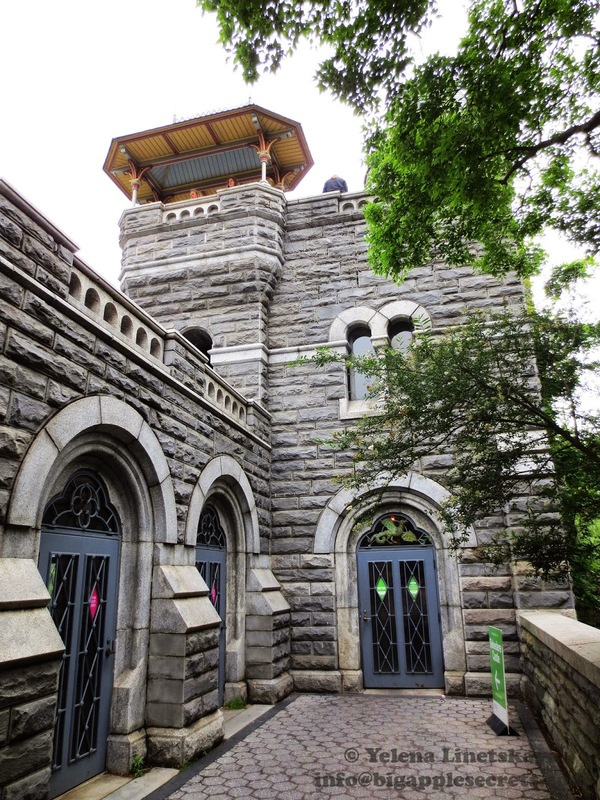 Calvert Vaux, co-designer of Central Park, created the miniature castle in 1869 as a lookout to the reservoir to the north (now the Great Lawn) and the Ramble to the south. New York's Central Park, the first urban landscaped park in the United States, was conceived in the salons of wealthy New Yorkers in the early 1850's. The site for the new park offered rocky vistas, swamps , and the old city reservoir. Architectural structures were to be kept to a minimum--only four buildings, including the Belvedere castle, existed in the original plans for the park. The castle was built as a folly, a fantasy structure that provides a great backdrop and views, but without a real intended purpose. Building material of the castle was chosen to assure that it was integrated as naturally as possible into surrounding landscapes. Portions of the castle are made from the same type of schist as the Vista Rock, creating the illusion of a castle rising out of the park itself. This stone had been taken from the granite quarried from Quincy, Massachusetts. The original plans for the building included another two-story structure on the site of today’s pavilion, but financial concerns halted construction. When built it was an open-air structure, with no doors or windows! In 1919 the United States Weather Bureau moved the Central Park Observatory to the castle. The first public meteorological observatory in New York was opened in 1869 in the Central Park Arsenal. 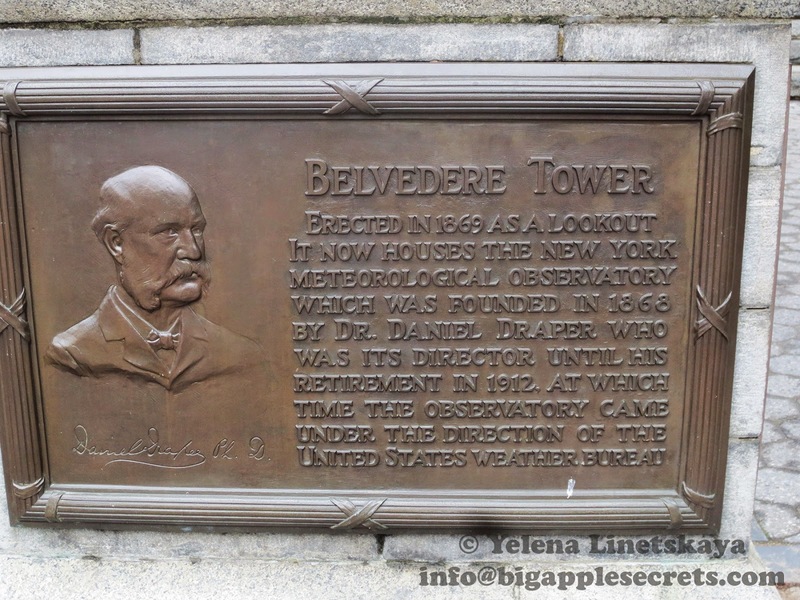 In 1911, the meteorological station was taken over by the United States Weather Bureau, and in 1912 it was moved to Belvedere Castle. In the early 1960s, the Weather Bureau installed automated meteorological instruments, the staff vacated the building and moved its offices to Rockefeller Center. Only automated equipment to was left n the tower record the weather. 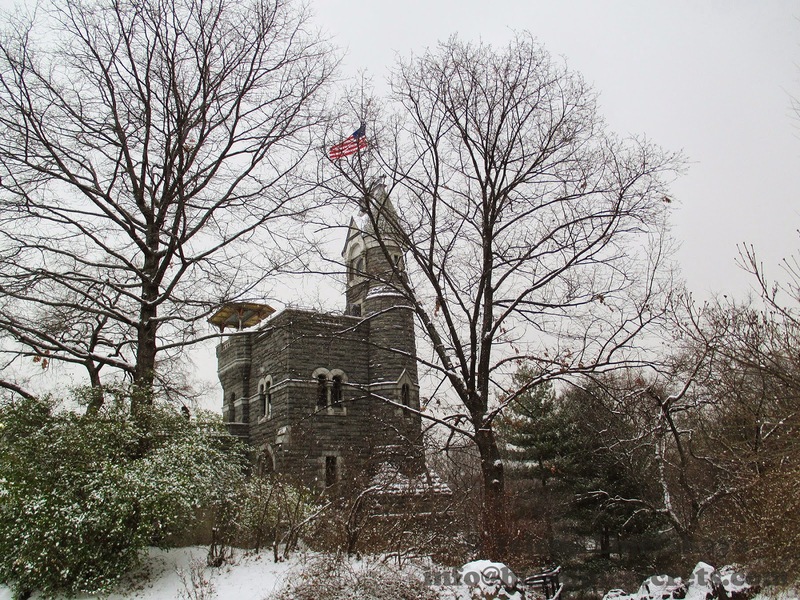 So when you hear “The weather in Central Park is…” on the radio or television, remember the information comes from Belvedere Castle in Central Park. 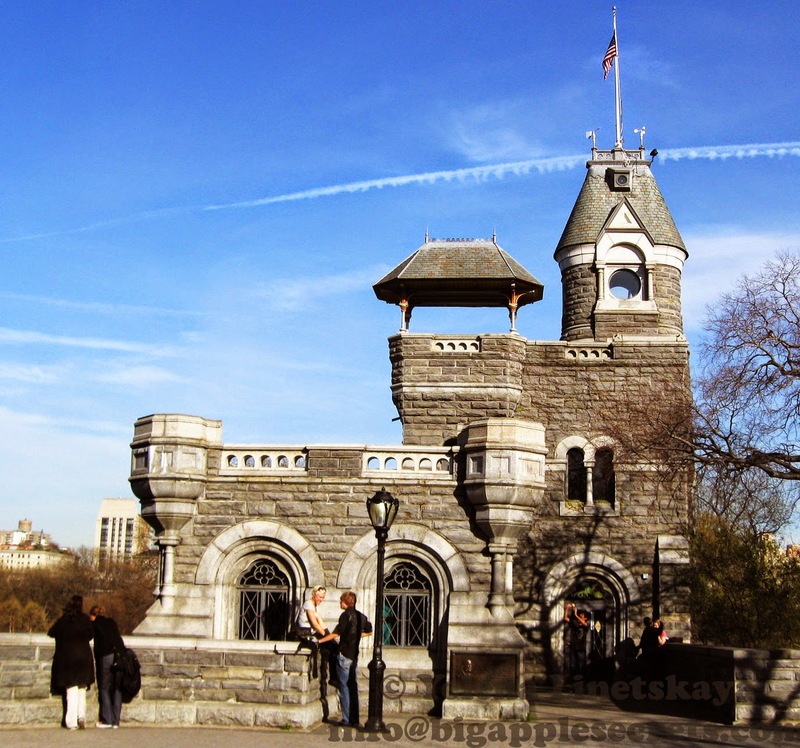 Belvedere Castle was closed to the public and became an object of much vandalism, neglect and deterioration. The Central Park Conservancy launched a restoration effort and reopened the structure on May 1, 1983. This castle has been converted into a visitor center with two lookout decks and a very tight winding staircase. Inside the castle there is a room with a small collection of natural history artifacts, such as skeletons and paper mâché birds. But the best thing that you can have are the views! The castle’s turret is the highest point in Central Park. You can see all the skyscrapers in midtown, as well as the upper west side from the lookouts. The castle is most easily approached from Central Park West at West 81st Street.